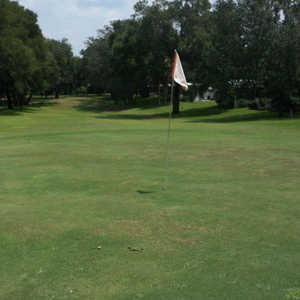 OCALA, Fla. - Delray Beach claims the oldest municipal golf course in Florida, a Donald Ross design that opened in 1923. 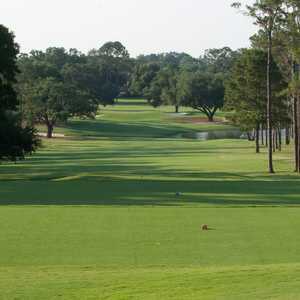 But, the Ocala Golf Club claims its opening, with nine holes, was in 1912. Ocala Golf Club has some moderate elevation, like here at the par-5 fifth hole. 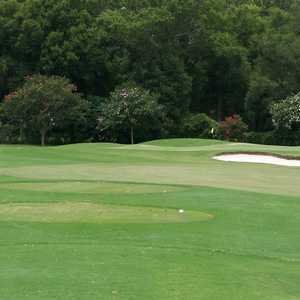 Other golf courses in Ocala, Fla. Ocean Trails in Palm Beach, opened in 1896, claims to be the oldest course in Florida. Whatever. In any case, the Ocala Golf Club is old. It's so old, no one can remember who the original architect was. It has had a lot of work done on it since, some of it by golf course architects, some of it by employees. Back in the 1970s, current Assistant Manager Tom Hanegan got so tired of looking at thick brush on one part of the layout by a street, he took it upon himself to clear it out. "The course is a lot better than it used to be," Hanegan said. "There used to be no grass and no irrigation." The old course has been modernized nicely, to keep up with growing Ocala and Marion County. Like most munis, it isn't long, around 6,300 yards from the back tees, but it's no pushover. The fairways are tree-lined, and many of the trees are ancient oaks, with spreading limbs that form continuous hazards. One oak, in fact, is said to be the third oldest in the state, a gnarled old fella that stands stolidly by the 18th tee box. Ocala Golf Club has several doglegs guarded by oaks as well. If you like oaks, you'll like this course. If you don't like hitting from under them, you won't, unless you can control your tee shot. It isn't always necessary to hit driver here, as the distance implies. In fact, the smart play is often with a long iron or fairway wood, since those doglegs are usually well guarded. The greens are no picnic, either. They're small, for one thing, like they used to be in the old days, and most are slightly elevated, with some tricky run-offs. "Everybody wants to think this is a Donald Ross layout," Hanegan said. "It's similar, but it wasn't Ross himself." Ross, of course, was known for his difficult greens. He popularized tabletop greens, notoriously difficult to stop approach shots on. The Ocala Golf Club at one time had some seriously difficult run-offs, but they've been softened over the years. Ocala Golf Club is a fine municipal course, and it might get better if officials follow through on their plans for a $2.5 million renovation this summer. It's short, but there are some very nice holes, like the par 3s over water, such as Nos. 2 and 14. The course has some gentle elevation, with uphill as well as downhill tee shots and approaches. A couple of holes have blind landing areas. There are birdie opportunities here, particularly on the short par 5s. The front nine has back-to-back par 5s: the 510-yard fourth, whose fairways is squeezed by a ditch that runs nearly the length of the left side and a pond to the right, and the 503-yard fifth, with its sharply uphill approach shot to an elevated green. The seventh is a downhill, 487-yard par 5. A good drive here will leave you with a mid-iron into the green. As with most good munis, green fees are very reasonable, at $23-$30 and $16-$22 for Ocala residents, and the facility is close to downtown. Frequent player cards are also available for $200. There's also a driving range that can be used at night. The Fairfield Inn Marriott in Ocala is in a great spot to enjoy the golf the area has to offer. It's right off I-75, on State Road 200. The hotel has all the amenities you expect from a Marriott property, including large guest rooms with in-room, high-speed Internet access, an outdoor swimming pool with a whirlpool and fitness center. The three-story building has nearly 100 rooms. The Fairfield has a free continental breakfast. There is no restaurant, but several are nearby.